Toggle between equal and just temperaments, or create your own temperament system. Adjust the pitch standard to A = whatever you need: 442, 430, 415, etc. This is extremely helpful for period instrument work. Select between 4 different difficulty levels, which narrow or widen the range of what the app will consider in-tune. 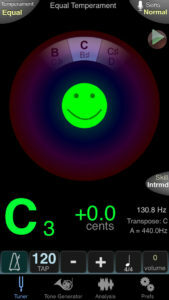 Easier settings are perfect for students, and they love the confused and/or happy face depending on whether or not they’re in tune! Analyze the waveform and/or plot the pitch of the note you’re holding. Note shapes and articulations become more than just an abstract concept. A colleague introduced me to this app as a way to get high quality recordings without setting up extra equipment. I use it both in my own practice sessions and in students’ lessons to give them something to model, especially if their particular piece or etude hasn’t been recorded. The user interface on an iPhone isn’t particularly intuitive – you’ll need to turn off the metronome, and take the default length limiter off before using it. Once you’ve done that, the default instrumental settings result in a pretty decent-sounding recording. 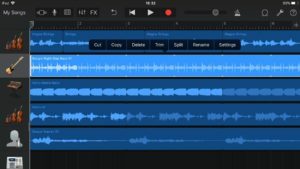 I’ve only scratched the surface of what the software can do – I’d love to learn how to make multi-track recordings, and find other creative ways to use it. 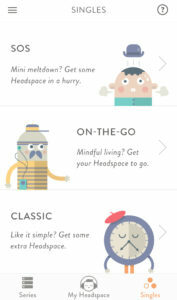 Headspace is a much-lauded meditation and mindfulness app. After completing a 30-day foundation course, you have access to an extensive library of topics. You can select from Packs, Singles, or Minis, and sessions range from as short as 2 minutes to up to 60 minutes long. I found the sport packs particularly relevant to audition preparation, including topics like analysis, motivation, training, and competition. This app was introduced to me by performance psychologist Dr. Marla Zucker. Deep breathing helps to regulate the parasympathetic nervous system – this article from Psychology Today explains why this is important. 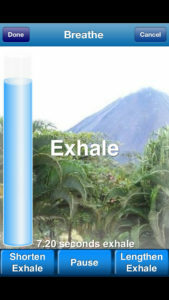 The app allows you to shorten or lengthen the inhale and exhale to find a rate that’s optimal for you. Regular deep breathing helps the body stay productive and calm in stressful situations, and in freelance life those can be plentiful. While a longer 10 or 15- minute session is ideal, even just a few cycles of breathing help me to regain my equilibrium on a tough day. I am a big believer in maintaining good overall fitness to improve musical performance. Brass- playing is inherently physical, and staying in shape allows me to keep my energy levels up while meeting the athletic demands of the instrument. It also helps me counteract the many hours of sitting inherent to what we do: rehearsals, teaching, and long drives. 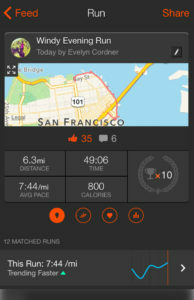 Strava is a GPS activity tracker for running, cycling, swimming, hiking, and more. You can see how many miles you’re logging, track your personal records, discover new route, and join challenges with other users. Ms. Krickler enjoys teaching students of all ages, and has presented masterclasses in both the United States and Canada. 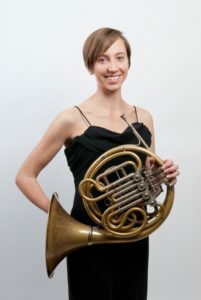 She holds faculty appointments at the All Newton Music School, Dana Hall School of Music, and Wellesley Public Schools.